1. Are you available for Scorps Junior Regional selection? 2. If selected in the squad will you attend the Scorpions Junior Elite Camp on 11/12 May? – Final teams will compete at the 2019 NSWTA Junior Regional Championships to be held at Orange Touch Association on 13-14 July 2019. Player and parent accommodation has been arranged. As per Scorpions policy, if a player is playing in the same division as last year and were in the final 14 player team (shadows not included) they are automatically included in the 2019 final squad (and invited to the camp). Example, Girls 14’s player from 2018 final team is automatically in the 2019 Girls 14’s squad. Girls 14’s player from 2018 final team plays Girls 16’s in 2019, she is not automatically included in the 2019 squad. Whilst attendance at the Scorpions Junior Elite camp is not compulsory for final team selection, those not attending the camp or missing any part are jeopardising their chances for final team selection. A case by case review on the players circumstances will be undertaken by Scorpions committee and coaches, with information needing to be sent to email@sydneyscorpions.com on final squad selection. 1. 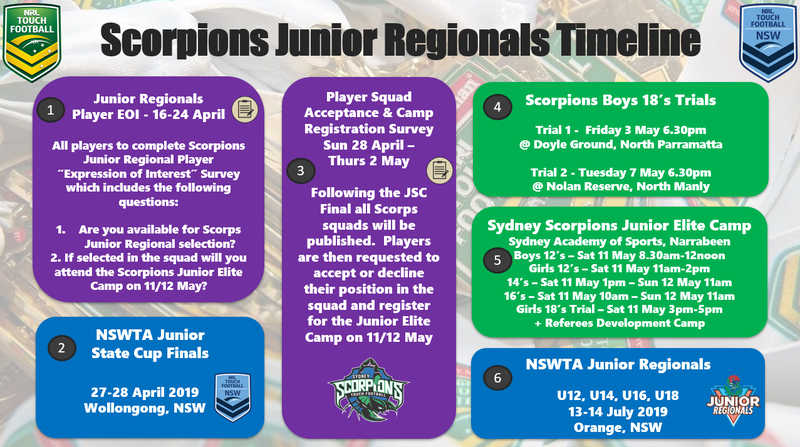 Are you available for Scorps Junior Regional selection? 2. Are you available to trial? – Approx. 30-35 player squads will be selected from the NSW Touch Junior State Cup Conference & Final will be invited to trial, squads will be announced by Monday 29 April. As per Scorpions policy, if a player is playing in the same division as last year and were in the final 14 player team (shadows not included) they are automatically included in the 2019 final squad. Example, Boys 18’s player from 2018 final team is automatically in the 2019 Boys 18’s squad. Boys 16’s player from 2018 final team plays Boys 18’s in 2019, he is not automatically included in the 2019 squad.